A back-to-nature heart buoyed Lewis G. Gazoul in crafting this ongoing adventure saga that has already captivated the imaginations and hearts of many. Gazoul has always enjoyed the wilderness. He and his family and friends have hikes, hunted and camped throughout the United States and especially all over the Upper and Lower Peninsulas of the great state of Michigan. The astonishing wonders of the outdoors became the context for a short bedtime story he whispered to his two children. Later, Lewis wrote that adventure episode onto a piece of paper, and from that page grew his vision for the vast, mystical and wondrous land that is the setting for his first two novels, Druids of the Faerie 1 & 2. The still evolving land and story remains true to the tale that enchanted his children, allowing their imaginations to flourish, showing the power behind faith in camaraderie and friendships, loyalty and integrity when reading about his faithful champions. 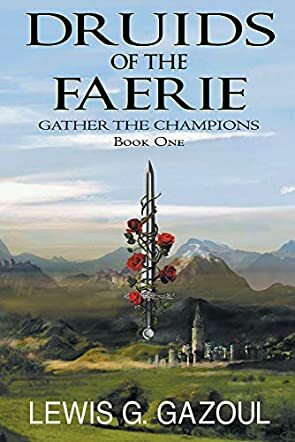 Though Druids of the Faeries: Gather the Champions by Lewis Gazoul is comparable to works by J.R.R. Tolkien, his work has unique twists that makes this a work on its own. The multiple fantasy characters add a lot of dimension as forces fight for dominion over this realm. The evil King Vokat and his son, Prince Ravek, have learned the secret of drawing more power through killing magical creatures, but this also works for the good. Calidor has been groomed as a conduit for the faerie magic once Master Yar dies, making him a force to be reckoned with. There are those who follow Prince Baytel. They pledge this small group to bring peace, though war may be the only solution. I found Druids of the Faeries not only well written but also well edited, making this very enjoyable to read. Lewis Gazoul's writing is fluent and flows easily, yet is very intense. The author puts you right on the battlefield, allowing you to hear the sizzle of the goblins' blood burning their flesh, see the hordes flying above you, and feel the evil that lurks in the dark forest. It is not an easy feat bringing these kingdoms together to fight against a common enemy, but Gazoul brings about a solution that will surprise the reader. Those who love adventure will enjoy this novel, and those who read fantasy will love it as the struggle is more than just good versus evil. There is an even greater danger that lurks on the verge of uncontrollable lust.